Remembering Bert Smith — by Todd Macfarlane | RANGEfire! Our good friend Bert Smith passed away unexpectedly on March 31, 2016. Unlike my old family friend Jack Walther (who was a good friend and co-hort of Bert’s, and died shortly after), who I had known most of my life, I had only known Bert, personally, for about 10 years. But I was fortunate enough to make up for lost time toward the end. Bert was still quite active, with a long list of things he still wanted to accomplish. Although his peaceful passing came as a surprise, at 95 (almost 96) years of age, it was not completely unexpected. I can attest that he was very actively engaged in good causes right up to the end. This remembrance is essentially a collage of things others have said about Bert, including parts and pieces of his obituary, as well as some of my own observations at the end. Bert Smith co-founder of Smith & Edwards passed away last night at home 96 years young after a truly monumental lifetime of preservation of our Constitutional Freedom, Liberty, and love of God and Country. 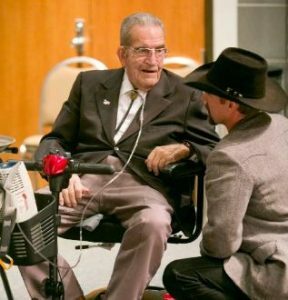 Bert Smith has lived a life fuller and touched countless others in a way that few accomplish in a life time. 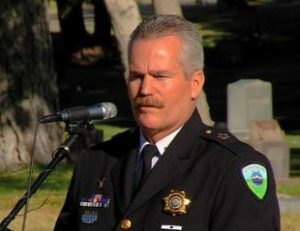 Bert has been a lawful, law-abiding, and respectful supporter of law enforcement and especially the Office of the Elected Sheriff which he held in great regard as a protector of individual freedom in America. He has been both a student and professor of America and our Constitutional Freedom and Liberties and has dedicated much of his financial success to the training, education, and protection of our Constitution. He has inspired countless others to support and uphold the divinely inspired intent of America’s framers in the enumerated freedoms enshrined in that document. His love for America as our founders intended and acknowledgment of divine providence in the founding of our country burned within him a deep passion for the protection of our freedom. He was dedicated and committed to his personal convictions and bold in his outspoken and ardent support of all who would join with him in courage and action to make a positive difference in our lives. I had the truly unique experience of spending hours with Mr. Smith in his office at Smith & Edwards being educated in the Constitutional Mandate of the Office of Sheriff and the significance of the only elected law enforcement position directly accountable to the people. I have gained a far greater understanding of the critical role that the Office of Sheriff plays in our lives and within the framework of the founding principles of our Constitutional Freedom outlined by the framers of our country. The impact that Bert Smith has had in my life is immeasurable and yet I am just one of countless others who have been the beneficiary of this great man of God and Country. Bert Smith truly lived a life of honesty, integrity, courage, passion, humility, and fidelity in all things. He lived a life of love and compassion for all and his actions spoke louder than his words in daily service to his fellow man. He will truly be missed and remembered as an active supporter of all that is good in this world that he has without question left as a better place for all who will continue to benefit from his selfless service. He has left an incalculable legacy for all of us to emulate and follow. Our love and prayers go out to his wonderful loving companion and bride Kathy Smith and the SmithFamily. According to a Salt Lake Tribune Article noting Bert’s passing, for a variety of reasons Bert was branded “Mr. Sagebrush Rebellion.” According to that article, among other things, he later helped bankroll the start-up of the American Lands Council, and generally supported the movement to have Western states claim ownership of the tens of millions of acres of federal lands within their borders. The article also noted that although Bert never ran for, nor held, public office, he was very active in Utah politics, holding counsel with senators, governors, congressmen and others. Former Congressman Jim Hansen was a particularly close friend. Scott Jenkins, R-Plain City, said that when he was considering running for the Legislature about 16 years ago, he got to know Smith; who gave him advice and financial support along the way. Smith would order “truckloads” of pocket Constitutions and give them out to anyone who wanted them or candidates who needed them. “When it came to the Constitution, he truly believed it was inspired and he was heavily involved in preaching it and teaching it,” Jenkins said. Jim Hansen said he and Smith had “dozens of conversations about the fate of the United States,” and Smith had strongly encouraged Hansen to run for Congress. Hansen introduced then-Gov. Norm Bangerter to Smith and said the two old farm boys were a perfect match. 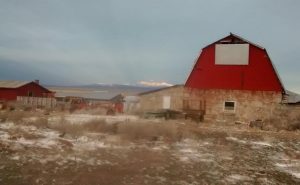 Going back to the very beginning, according to his obituary, Bert was born April 29, l920 to Arminta Willie and George Albert (Pinto) Smith on their homestead in Holbrook, Idaho. He learned the store business in his parents’ Smith General Store. By 1928, Bert‘s father had to give up homesteading and the Store and the family headed for Ogden, Utah and cattle dealing. 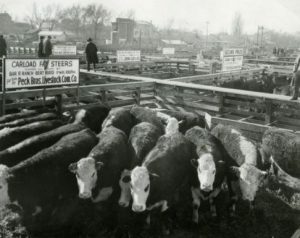 In the 20’s, the Ogden Stockyards were humming and Pinto Smith, a cattle broker and horse trader, brought home enough money to buy a brick house for his family and a touring car. During the Depression, the family lost their home and moved into the bunkhouses at the stockyards. Bert at 16 went off on his own, started hauling and soon bought his own truck. Bert met Amelia Shaw at Weber High School and married her in January of 1941 in Liberty, Utah. Life was good for Bert, Amelia and their family in west Ogden until 1944 when Bert was drafted. Within three weeks, he had to sell his trucking company and report for duty. He enlisted in the Marine Corps on June 14, 1944 and served in the South Pacific as an armored amphibian tractor crewman from January to September of 1945. Bert and Amelia’s first son, James Bert, was born on V-day, August 14, 1945. After his discharge on November 27, 1945, Bert said he spent the rest of his life trying to get even with FDR for making him sell his trucking business and leave Amelia and little Sherma behind. Amelia was the hero, saving all the money from the sale of the trucks and living on $85 a month while Bert was gone. After the war, Bert found a ranch for sale in Ruby Valley, Nevada and with Amelia’s savings, sheer hard work and risk-taking, bought it 30 days later. He made his brother, Paul, a partner when he returned home from his Army service in the Philippines. There was never a brother more loyal than Paul, Bert often said, and he appreciated Paul’s lifelong dedication to the OX Ranch. 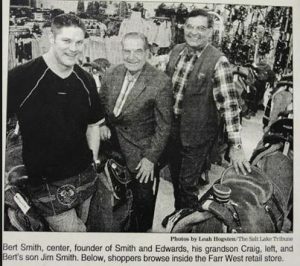 While Paul was holding down the Ranch, Bert continued to grow Smith & Edwards, the military surplus store he founded in 1947. Those 13, 418 Navy mooring buoys he bought in 1962 were a great example of his legendary risk-taking. Lawrence Edwards thought Bert a little too wild and they parted company but always remained very good friends. The sign on Smith and Edwards, The Country Boy’s Store, in Farr West, Utah proudly declares “We Have Anything You Want…If We Can Find It.” Berth’s grandson, Craig Smith, has served as president of Smith and Edwards since his dad, Jim Smith, died of cancer in March of 2013 and will carry on smoothly at Smith & Edwards with the help of over 100 loyal employees. Bert began studying the Constitution and the principles of the Founding Fathers in the 70’s and encouraged many thousands of others to do the same. One of his many converts to the Constitution was Kathy Hyde, who he met in 1975 and invited her to study at the Freeman Institute, now known as the National Center for Constitutional Studies. Kathy spent her life volunteering, most often for political causes. Kathy and her family stayed in occasional contact with Bert and Amelia through the years. When his old friend Kathy Hyde ran for the Layton City Council in 2005, Bert supported her campaign with pocket Constitutions. The friendship that began 30 years before turned into a wonderful marriage of nearly ten years. 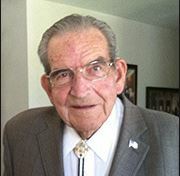 Among Bert’s many friends and acquaintances was Idaho attorney, Fred Kelly Grant, who also spend a lot of time addressing federal land-use issues, and ultimately became known as “Mr. Coordination,” based on his leadership and legal work regarding what is known as the coordination process. Although Fred was not well himself, upon learning of Bert’s death, he wrote a tribute, based on their mutual experiences. Read Fred’s Bert Smith Tribute FKG. Now, here’s what I have to say about Bert. Bert’s life, works, and record speak for themselves. 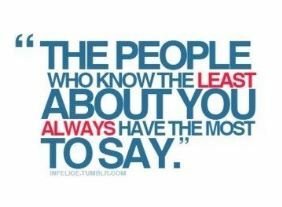 After all the good things so many others have had to say, much of what I might say would probably sound repetitious. Bert was a remarkable man. Anyone would have been very fortunate to be able to have him as a friend, and I am so thankful for the privilege and opportunity I had to work with him and his good wife Kathy. I was truly impressed with his never-ending desire to continually learn new things, gain better understanding, challenge his own paradigms, and adjust his thinking based on new understanding — right up to the day he died. Rather than repeat what so many others have said, I am going to direct most of my remaining comments toward Bert’s critics, some of whom became very aggressive toward the end of his life, and have continued their attacks even after his passing. Although I am not aware of any illegal, immoral, or even unethical activity that could possibly warrant these attacks, as far as I can tell, most of the vitriol is based on Bert’s generosity with hard-earned financial resources to causes that he believed in, including constitutional education, and the concepts of fundamental freedom and liberty, states’ rights, separation of powers and balanced federalism. 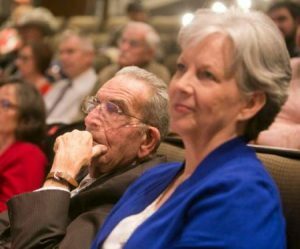 If there is one thing that Bert Smith could never be called, it was “anti-government.” He cared deeply about how we are governed as a people. Bert was no luke-warm, fence-sitting sort of person. I find it interesting that if he had been on the other side of the fence, and done all the same things, exactly the way he did them, but agreeing instead with his critics’ points of view, and contributing to their causes, they would have sung his praises and given him awards (although the awards would have been small, because the amount of money donated to such causes on that side of the fence would make Bert Smith’s financial resources and contributions look like small potatoes, by comparison), but based on nothing more than differences of opinion, even after his death, these critics have attempted to cast Bert as the face of evil itself — particularly with respect to land-use issues. As with many such situations, the basis and substance of their attacks tell us far more about them than it does about Bert. Envy is said to be one of seven deadly sins. As far as I can tell, envy is also the primary basis for such attitudes toward Bert Smith — based on jealousy that fundamental freedom and liberty should have had such a champion. In conclusion, it might be tempting to say “rest in peace Bert” or express some other supposedly fitting sentiment. But “resting” never seemed to be very high on Bert’s bucket list. So I’ll say the same thing he would have said to me, “Carry On.” And I have no doubt he is.